This album is horror-rock at its best, pounding hard rock with elements of punk, rockabilly, blues, and surf mixed in just right. And all played with a winning sense of humor. 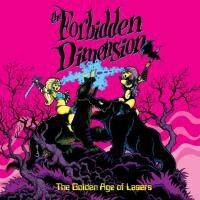 I'd never heard of The Forbidden Dimension before listening to The Golden Age of Lasers, but they've apparently been making music in Calgary on and off since 1988, unjustly toiling in obscurity to the world at large. This album is horror-rock at its best, pounding hard rock with elements of punk, rockabilly, blues, and surf mixed in just right. Lyrically, the songs are the stuff of classic horror movies, sung with a winning sense of humor by bandleader Jackson Phibes. The slinky "Haywire Hannah" is a chugging ode to an attractive witch, complete with Farfisa organ underpinnings and over the top guitar solos. "Lillydale Orphanage" details the lives of children at a horrible orphanage, but does it with an extremely catchy, singalong chorus. Album opener "Where's My Wolves" begins with a creepy piano solo that intentionally evokes the theme song to John Carpenter's Halloween before exploding into '70s-style guitar riffs, complete with tropes like vibraslap, cowbell, and hyperactive drum fills. The highlight of the record, though, is the hilarious "Tor Johnson Mask", which is a treat for B-movie fans with its referential chorus "Now is time for go to bed!" In an alternate universe (an idea The Forbidden Dimension would surely appreciate), record label representatives would've descended on Calgary instead of New York City in the early '90s, giving Phibes the career and success that Rob Zombie ended up having.